Wall Street Isn't Shaping the New York Mayoral Race. Thank Public Financing. With the Democratic primary for New York City mayor now just a week away, the candidate leading in the polls is the one who presents the most direct threat to the wallets of the city’s financial elite. Public advocate Bill de Blasio has framed his campaign as a challenge to the city’s soaring income inequality and has vowed to redress it, by among others things, hiking taxes on families making more than $500,000 to pay for expanded pre-kindergarten classes. You might expect that the barons of Wall Street would be doing everything in their power to head off this possibility and boost candidates who are more likely to preserve the status quo of the Bloomberg era, such as City Council Speaker Christine Quinn or, on the Republican side, former MTA chairman Joe Lhota. But so far, the race has been notable for the relatively small impact made by Wall Street’s big political donors. What gives? Are the one-percenters asleep at the switch? Are they confident that de Blasio’s bark will prove worse than his bite? Are they in fact open to some of what he’s talking about? There may be something to each of these. But the most obvious explanation for the absence of a massive push by the upper crust to stop de Blasio is that it wouldn’t be easy under the city rules. The city caps individual contributions to mayoral candidates at $4,950. More significantly, the city is one of very few jurisdictions in the country with a public campaign financing regime. Each dollar that a donor gives to a candidate for city office, up to $175, is matched by six dollars in public funds. The obvious effect of this is to greatly magnify the role of small donors. If a candidate can get 20 people in his or her neighborhood to give just $100 each, that translates into a total of $14,000—far more than the candidate could get from getting one or two wealthy New Yorkers capable of writing a check at the maximum level. And this is no mere hypothetical. The incentives of public financing have transformed campaign funding in New York into a much more egalitarian affair than we are used to in our political system (that is, at least in the years when one of the world’s richest men isn’t paying for his own campaign). 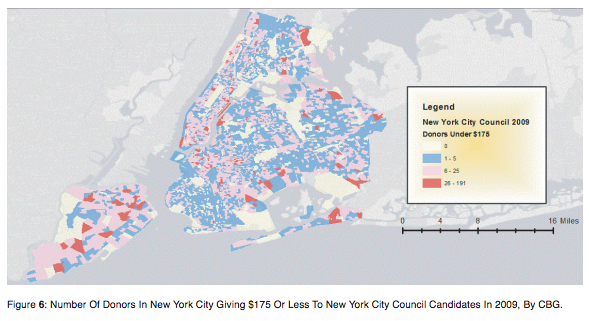 A study by the Brennan Center at New York University and the Campaign Finance Institute found far higher participation in campaign giving to City Council candidates in New York than to candidates for state office, where matching does not apply. In 2009, 89 percent of census block groups in the city (areas of about 1,500 people) contained at least one person who’d given up to $175 to a Council candidate—three times the proportion that contained someone who’d given that amount to any candidate for state legislature. 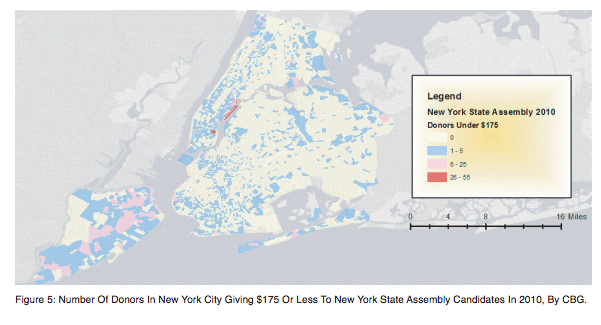 And, as the remarkable maps illustrating the study show, the contrast was even sharper if one looked at the rates of multiple small donors within a census block group. But the discrepancy shrunk when it came to big donors—only 11 percent of census block groups contained someone who’d given at least $1,000 to a Council candidate, barely more than the equivalent rate of big checks to state races. The more broad-based nature of the participation in Council elections also made it far more racially diverse—the average nonwhite ratio in census block groups that produced small checks for Council races was 54 percent, just about at the citywide non-white ratio of 55 percent, and well above the 39 percent average nonwhite ratio for areas with at least one small donor to General Assembly races. “Even in … high-poverty areas, there are substantial numbers of small donors contributing to City Council candidates,” the report found. The stark contrasts in giving to state and city races can surely be explained in part by the fact that the City Council seems more present and relevant to average New Yorkers than the work of legislators off in dysfunctional Albany. But the most likely explanation is that candidates for city office have far more motivation to be drumming up small checks. (With matching funds included, the proportion of donations from Brooklyn’s Bedford-Stuyvesant neighborhood to Council candidates in 2009 was 11 great times greater than the share of contributions to the city’s State Assembly candidates.) This is the chief argument for those pushing the state to adopt a public financing system similar to the city’s: it is a way to bring the funding of democracy much closer to the one-person, one-vote ideal of our actual voting (full disclosure: the owner of this magazine has been a leading advocate in the push for public financing in Albany.) It is no accident that the same hedge fund managers who are giving so little to mayor candidates this year (Chris Quinn has gotten the most, with $170,000) gave a whopping $7.1 million to candidates in 2010 race for governor, making them the second largest source of funds, after the real estate industry. In Albany, their money still talks far louder than their absolute numbers. But in the city, they are much closer to being merely one in the madding crowd. Which is a big reason why de Blasio has a real shot at becoming mayor. And if he does, it won’t just be the teenaged son with the big afro and winning smile that done it. It will be the system that allowed it to happen.